Tonight was our first official meeting and we have now come full circle. We are back to Wreath I. There are two girls that are from the original group and have done this wreath already but it really doesn't matter. We have all changed so much in four years. In fact as I prepared for the meeting, I realized it felt like I was doing the meeting for the first time. We have eight girls this year. A few girls graduated and moved on to our Wild Flowers group. The feel of the group is so different. My daughter is struggling with most of her friends being gone but I know she will soon feel that all is well again. Our group ranges from age four to age 10. Most of the girls are really young to me. It really has a different feel and it will take me a little bit to figure out the group as well. I'm not used to the little ones as much anymore, But we will be having lots of fun. We did a really fun activity which I found here. I read the quote from Dr. Martin Luther King, “You don’t have to see the whole staircase. Only the next step.” We talked about what it meant and then turned off all the lights. I had all the girls stand in a beam of light and then read the lesson. Talk about easy!!! I had Hershey Kisses wrapped up as roses as the treasure at the end. It wasn't quite dark enough, but luckily there was a little time at the end so the girls got to play it again. They really enjoyed it. For some reason, I felt at a loss finding a good craft for Faith. Having a different flowers every month will come in handy. So today we made our pretty sunflowers. I think this will be the most difficult thing about having such a wide range of ages. I didn't want to pick a craft that was too simple of the older girls. This may have been just a little too difficult for the young ones, but that's the good thing about having the moms involved. They were there to help their daughters as needed. This was a pretty inexpensive craft. I bought a package of yellow paper plates and then a thing of yarn. I did wind up buying plastic needles but now we will have them for years to come. After using coupons, it cost $10.00. It looks like I'm signed up to do at least the next meeting as well. I'm certainly hoping that more moms will start signing up, but I understand how it might feel a little intimidating at first. I'm also homeschooling my kids this year so I'm not sure how much blogging I will be doing. It's so great having a record of most of our meetings though so I am going to try to keep at it. If I disappear for a while, you'll know I'm just going a little crazy with homeschool. 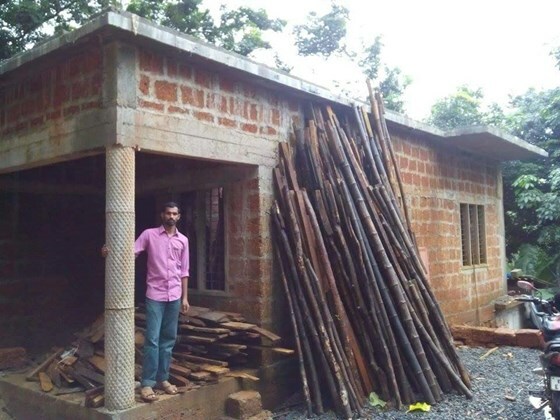 Just an update on Deacon Joseph and the house he is building for his parents. The outside work is done!!! While there is much to be completed on the inside, he has accomplished what he set out to do. He has asked that I thank all those of you that may have donated or said prayers for him and his family. Both are very much appreciated. We need to keep him in our prayers as the day of his ordination draws closer. I am keeping the widget up on this site until his ordination date. I know his ordination is very expensive and there is much still left to be done in the house. Please continue to keep him in your prayers. Thank you again from Deacon Joseph and myself!! It is that time of year when things are getting busy, busy, busy!! Also time for our Little Flowers group to get together for our annual sleepover in the church hall. The weather was perfect and we had lots of exhausting fun!! As always, we started off with a pizza dinner and then go into the church for a short prayer. The girls are so excited to get started with the festivities, but I remind them that we need to give thanks to God before everything else. This year, we had a talent show to help the girls with their confidence which was this month's virtue. It was fantastic. We even had some moms get up and show off their talents. It was truly a hit. It was really neat to see the girls get up and show a part of themselves that perhaps we had never seen before. We had instruments played, a dancer, a jump roper, a poem reciter and book readers, an balloon animal maker, a singer and even a girl show off the earrings that she makes. We have decided that it was such a hit that we will continue to do this each year. You could just see the smiles from the girls when they finished their talent. What a wonderful confidence booster. During the evening, we also heard the girls complimenting each other. It was fantastic. The weather was so nice that we spent the rest of the evening playing outdoors. Since usually our meetings are so structured, and the girls don't get a lot of time to just play, that's we let them do. We have a beautiful grassy area for them to just run around. I also bought bubbles and glow sticks. It doesn't take much to keep them happy for hours. Once it was quite dark,and we could tell that some of the girls were getting tuckered out, we came in for our sundae bar. Certainly a delicious treat to help cool down after all the running around. Lots of toppings to choose from!! Once that was all cleaned up, we had the girls get ready for bed. I read them a story and then let them giggle and talk for quite a bit longer. Finally around 11:30 or so, we told them it was time to quiet down and go to sleep. I think by midnight they were actually all sleeping. We also told them that they could get up early but needed to stay quiet and in bed until 7:00 am. It worked!! Saturday morning we got up and had breakfast at 8 am. Everyone just brings something and we have a feast. Then we go over to the church and pray the Rosary together and end our sleepover with a craft. This year, I thought the craft went well with the virtue, Confidence. I found it over at Brave Girls Club. I had the girls pick their faces ahead of time and then had the pictures printed out over at Staples. The girls got to pick all the different colors and trinkets that they wanted. I asked the moms to help them with this project and it was wonderful to see the mothers and daughters working together. This project took a couple of hours and that was speeding up the drying time with hair dryers. We would not have been able to do it during a regular meeting. I somehow missed one the portraits but I love how each one is unique just like our girls. It was a great way to end our time together. Everyone helped put the hall together and then it was time to go home and probably get some rest. Unfortunately, I was not able to attend this month's meeting so there aren't a lot of notes. can differentiate between pride and confidence. house or church she visited. means. We listed the 7 sorrows and Gianna passed out a prayer for the families to pray in relation to this. using yarn, glue, buttons and jewels. Very simple. During the month of May to honor Mary, we have our annual baby shower to benefit our local pregnancy center. We set up a pack-n-play at the back of church and throughout the month of May, we ask parishioners to bring in baby stuff to donate. By the end of May, the crib will be overflowing and we will deliver all the gifts to the pregnancy center. This is such an easy project for Little Flowers to do and it's a good way to talk to the girls about what it means to be Pro-Life. At the beginning of the meeting, we had the pleasure of having our priest come talk to us about the virtue of the month, docility and how he had been docile to God's call. It was great for the girls to hear about his experience. While we try to follow the schedule that we put out at the beginning of the year, we have to be flexible. Our tea party had been schedule to take place over the weekend, but I wound up having surgery a month ago. I knew I wouldn't be up to organizing everything. So instead of the clean up we were supposed to be doing this evening at our meeting, we needed something to fill the slot. Jessica came up with the wonderful idea of having the girls paint tea cups for our tea party. We first thought about going to one of those do it yourself pottery places, but decided that was just a little more (ok, a lot more) than we wanted to spend. 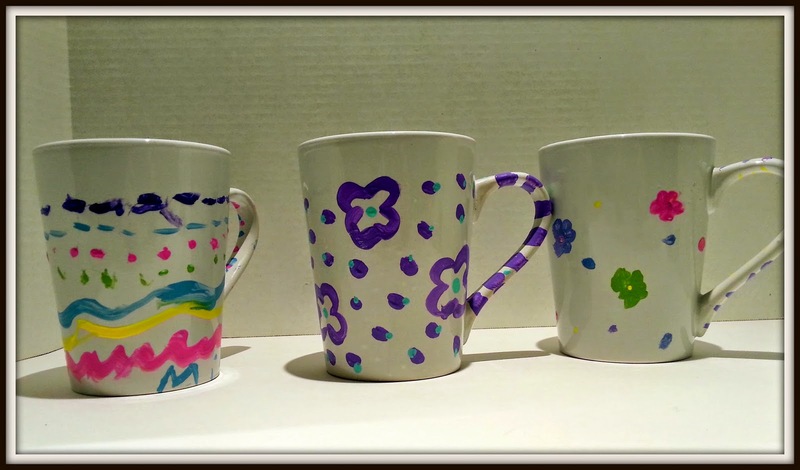 Instead we got mugs from the dollar store and used Folk Art Multi-Surface paint. It was a much cheaper option. For 14 mugs, 10 bottles of paint, paint brushes, styrofoam plates, and a couple of table clothes, the total was $43. We actually only used half of the paint. Place project in a cool oven. Set oven temperature to 350ºF. Once temperature has reached 350ºF, start timing for 30 minutes. After 30 minutes, turn the oven off. Glass must heat gradually with the oven to avoid breakage. Do not place glass in a hot oven. Let glass cool completely in oven. Do not use for 72 hours. I copied the instructions for everyone to take home. It worked great. The girls seemed to all enjoy making their creations. We also had a little excitement in the middle of the painting. We got the alert that there was a tornado warning. We put the painting on hold and headed down to the basement. Luckily it was Nina's birthday and she had brought cookies to share with the group. We kept things lighthearted and enjoyed the little break. After a while, the storm passed and we headed back upstairs. Luckily the paint brushes didn't get dried up. I am sure they will like getting to use them at the tea party in June. For our second meeting of the month of silence we had the girls embroider burp cloths for our baby shower in May. We asked a lady from our parish to come in and give the girls a beginner's course on embroidery. She did a fantastic job! First she showed them some examples of her own work so the girls got an idea of what embroidery is and what all is possible if you put some effort and time into practicing. Then she explained step by step how the girls should go about embroidering the burp cloths. Some girls caught on fast and added their own touch to their work, others followed along step by step. But all of them did a great job and they all enjoyed it! Wild Flowers - Our girls are growing up! Now that some of our girls are getting older, we decided it was time to start looking into beginning a program for the middle school aged girls. The Little Women Hospitality Program looked perfect, but we needed to make a few changes as we want it to spread through all 3 years for the girls. We will be using the program but also coming up with things that we feel are important as well. "He set before me the book of nature; I understand how all the flowers He has created are beautiful, how the splendor of the rose and the whiteness of the Lily do not take away the perfume of the violet or the delightful simplicity of the daisy. I understood that if all flowers wanted to be roses, nature would lose her springtime beauty, and the fields would no longer be decked out with little wild flowers. And so it is in the world of souls, Jesus' garden. He willed to create great souls comparable to lilies and roses, but He has created smaller ones and these must be content to be daisies or violets destined to give joy to God's glances when He looks down at His feet." 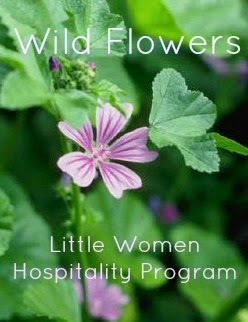 What is Little Women Hospitality Program? A Fun, Flexible, Faith-filled Catholic program for young women! Little Women Hospitality Program is a Catholic program for girls ages 10 and up. This program teaches the virtue of hospitality through classic literature, spiritual insights, the Catholic faith, and hands-on experience. The girls earn charms for a bracelet or necklace as they learn new skills. 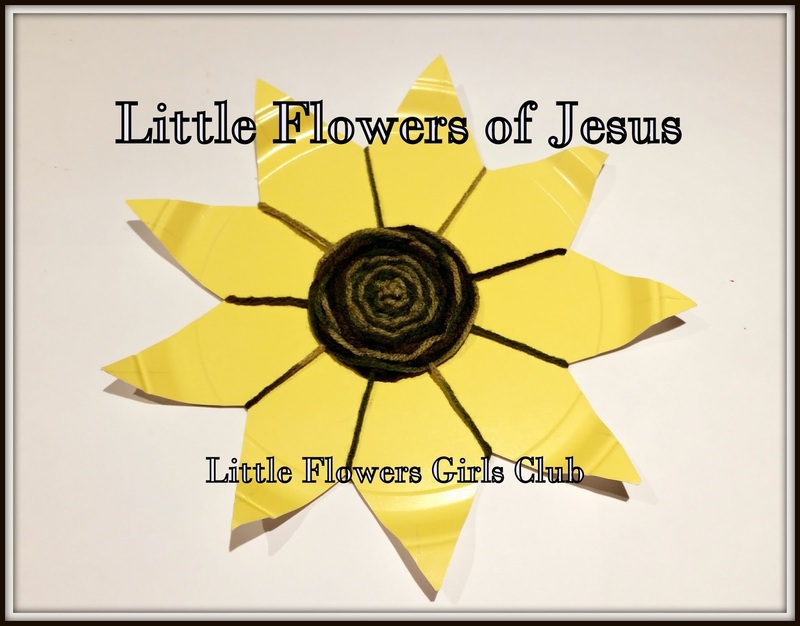 A great follow-up and supplement to Little Flowers Girls' Club! The Little Women Hospitality Program, developed by Ann Milligan Callaghan, is a two-year, Catholic girls', ten-month program that aims to teach young ladies the various aspects of hospitality. Each month, the girls learn a new skill or "charm" as up-and-coming hostesses, young women, and Catholic mothers. Year I are as follows: cooking, cleaning, setting and clearing a table, manners and conversation, preparing a room for a guest, writing correspondence, bringing hospitality to others, sewing and dressing modestly, putting on a tea party, and running a book club. Year II are: laundry, care for the elderly, personal cleanliness, tradition, art and beauty, interior decorating, public speaking, gardening, friendship, and hosting a picnic. Using scripture, literature, skill practice and field trip suggestions, the program helps the girls become confident and gracious hostesses. It is filled with wonderful stories, heroes, saints, and practical skills that will enrich the lives of the girls as they learn to grow into women. Earn one each month as you learn a new skill! Collect your “charms” on a chain bracelet or necklace. Each charm corresponds to a lesson and skill covered per month in the club meetings and manuals. This is how we plan to spread it out over 3 years. Hosting a Picnic - Oct.
Sewing & Modesty - Nov.
Art and Beauty - Nov.
May 9 - Plan & Prepare a Party- Tea Party - Discuss & decide on menu/ favors/ place/ etc. We plan to start the program in the Fall and already have at least five girls who are planning to join. We will also start advertising it in the bulletin in the coming weeks to give other families time to look into joining as well. I look forward to being able to write about our new adventures in the Fall. Prayers would be appreciated.